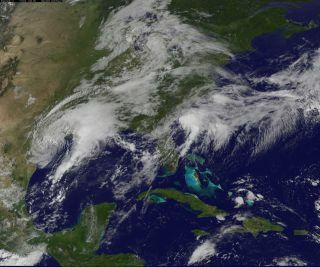 Tropical Storm Harvey is seen early Aug. 28, 2017 as it moves back toward the Gulf of Mexico in this NASA image from the GOES Earth-observation satellites. NASA is monitoring Tropical Storm Harvey as it moves back into the Gulf of Mexico this morning (Aug. 28) after causing heavy rains and severe flooding across Texas and Louisiana this past weekend. Harvey initially hit the Texas coast as a Category 4 hurricane on Friday (Aug. 25). NASA's aptly named Aqua satellite — "aqua" is Latin for "water" — has been gathering data that has helped scientists identify the clouds within the tropical storm that are capable of generating heavy rainfall. The Aqua spacecraft made readings using one of its instruments, known as the Atmospheric Infrared Sounder (AIRS). The instrument detected the temperature of the clouds in the storm using infrared light, and scientists used that information to find out how large — and therefore how powerful — the storm clouds were in any given area the satellite surveyed, according to a NASA statement. "The higher the cloud tops, the colder and the stronger they are," officials wrote in the statement. "So, infrared light … gathered by the AIRS instrument can identify the strongest storms within a tropical cyclone." This infrared view of Tropical Storm Harvey was captured Aug. 28, 2017 by NASA's Aqua satellite. The strongest storms appear in purple and stretch from southeastern Texas to Louisiana, and into the Gulf of Mexico. On Sunday morning, AIRS discovered that Harvey's coldest clouds — those capable of dropping the heaviest rainfall — were near the tropical storm's center and east-of-center, which corresponded to areas extending from southeastern Texas into southeastern Louisiana. The cold clouds have temperatures as low as minus 63 degrees Fahrenheit (minus 53 degrees Celsius). According to NASA's Aug. 27 announcement, JSC's senior management will evaluate the conditions of the facility and nearby roads on a "day-to-day basis." For those in need, NASA also recommended using the FEMA mobile app and the Red Cross map to locate the nearest shelters.